Comping and chord soloing over minor ii V i chord progressions can be a tough hurdle to get over when learning jazz guitar. Comping and chord soloing over minor ii V i chord progressions can be a tough hurdle to get over when beginning your journey into the realm of jazz guitar. While there are many different voicings you can use to comp or solo over this common progression, with many offering important chord colors that should be explored in your practice routine, sometimes the easiest way to navigate this progression is to stick to one voicing and use it for multiple chords in a minor ii V i. In today’s lesson, we’ll be looking at how you can use a m7b5 chord to comp and solo over both the ii and V in a minor ii V i chord progression, allowing you to outline the changes without having to over think the harmony in the process. To get us started, here is a fun lick using the different concepts that will be discussed in this lesson. 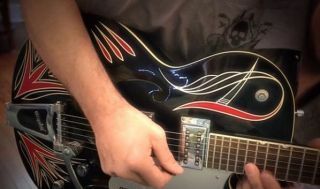 Start by learning the lick, then continue reading the rest of the lesson as we break down the lick into it’s smaller components and explore the concepts behind the construction of the lick itself. Here are the underlying chords of the previous lick without any ornamentation. You can see under each chord the name of the voicing that is being superimposed over the given harmony to produce the sounds heard in the lick. The first chord is directly related to the Am7b5 chord in the harmony, but, the second chord is played as Cm7b5 over the D7alt written in the chart. This concept, of playing a tonic m7b5 chord over a iim7b5 chord and a m7b5 chord starting on the b7 of the V7alt chord is a concept I call Parallel m7b5 Chords, and it can give your minor ii V i chord soloing ideas a big boost as you can use one shape to navigate two different chords. The third bar features a Bbmaj7 played over the given Gm7, which is a 3 to 9 chord superimposed over the Gm7, Bbmaj7 produces the intervals b3-5-b7-9 when played over Gm7. Try this example out and then take it into different keys, string sets and begin to bring it into your solos as you explore these voicings further in the woodshed. Finally, you can add in notes from the underlying scales to connect each chord in the phrase, allowing you to move up from one chord to the next in a linear fashion, without having to jump around the neck, while giving you more notes to improvise with at the same time. In this example, you can see how I used the note D to connect Am7b5 with D7alt, and the note F as an extension of the D7alt chord. When using F and Eb as the top two notes over D7alt, you can start on the F, then lead down to the Eb and resolve that to the 3 to 9 chord used in this example. Or, if you wanted to continue moving upwards with the lick, you could keep to the Eb-F movement, and then just resolve to a different inversion of Gm7 in the second bar, one with a G as the top note for instance, giving the line an Eb-F-G melody line in the process. After you have checked out the parallel m7b5 chords in the above examples, take them to different keys, different string sets and begin to improvise with them over your favorite tunes as you bring them off the page and into your solos. What do you think of the Parallel m7b5 chord approach over minor ii-V-i chords?